« OFF TO THE ASLA EXPO! 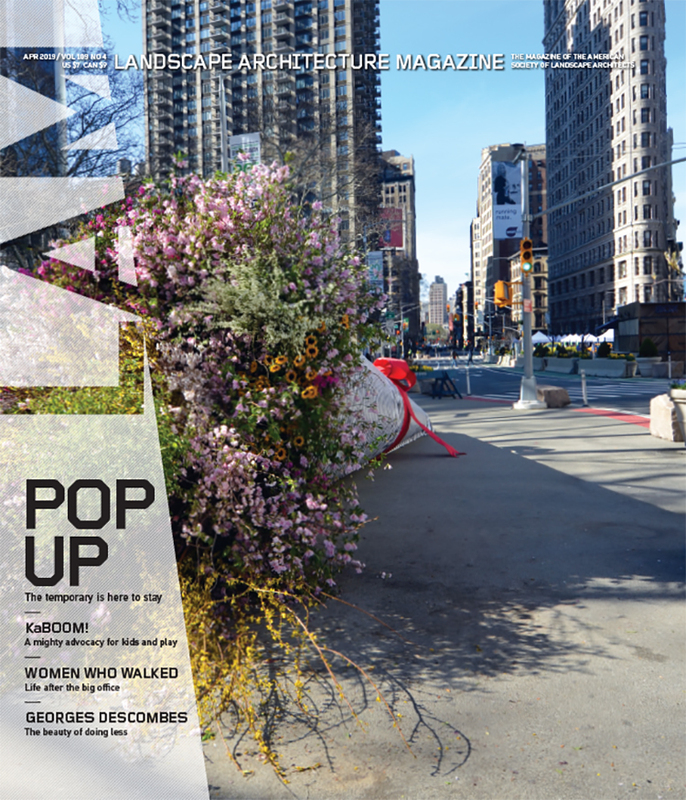 In the November LAM, we report the backstory on the Rebuild By Design Competition. HUD has just announced the selection of 10 projects that will move forward to the next phase of the competition. 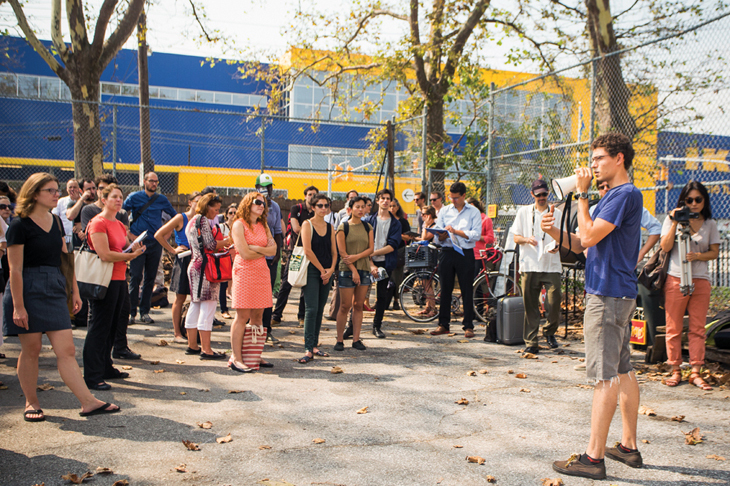 Ten teams convened for education sessions as part of the Rebuild by Design competition. 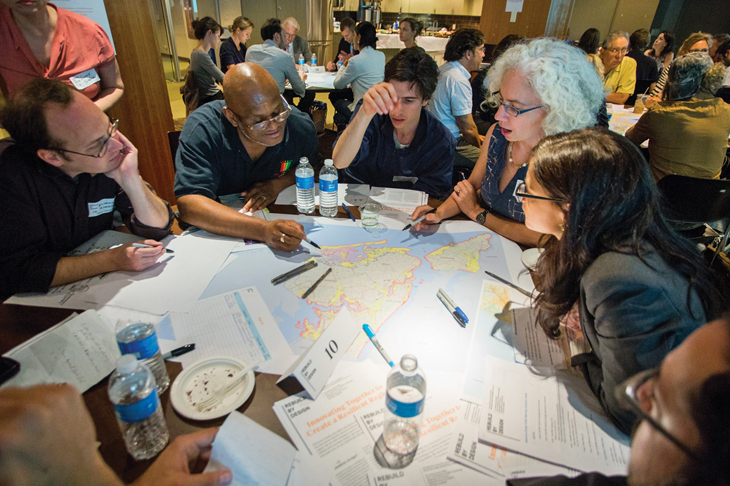 The Department of Housing and Urban Development and its partners this past summer announced the 10 finalist teams for Rebuild by Design (RBD), a multistage competition to rethink development in the New York City area after the devastation of Hurricane Sandy. Landscape architects are well represented among the teams, of course. Most of the big names are there. But there’s another name that is probably more obscure: the Institute for Public Knowledge. This think tank, based at New York University, is essentially running phase two of RBD. It will lead the deep analysis portion of the competition, working with the design teams to help them better understand the landscape. So what exactly is IPK and what is it doing with New York? First, RBD is not a typical competition. The ultimate goal of the program is to spend around $5 billion from the congressionally approved Sandy Recovery Fund on projects that will make the metro area more resilient to future storms (seen as more likely as a result of climate-change-driven sea-level rise and erratic weather patterns). RBD is broken into four stages. First, candidates applied to the program based on their own skills and experience; no project proposals were requested. In the second stage (that’s where IPK comes in), the 10 teams selected after stage one are developing three to five conceptual design ideas, not necessarily linked to specific places. Another selection process will winnow those to one per team, and then these same 10 teams will develop their selected project more in phase three. Stage four will see additional refinement—though no elimination of teams. Those 10 become the candidates for the recovery fund money. Clearly RBD is strange because the 10 finalists will be allowed to stick it out until the end. But rarely do competitions strive to teach the entrants so much. “Our job is to help the 10 final teams do an analysis of the needs, vulnerabilities, and possibilities of the region,” says Eric Klinenberg, a professor of sociology at New York University and the director of IPK. “We are curating a learning process for these teams.” IPK was founded six years ago to try to connect the ivory tower and Main Street. “People working in universities have the capacity to engage the world as productive citizens,” Klinenberg says. “But it takes real work to translate much of our research into things that have real meaning.” More simply: How can academics help the average person? The teams took tours of devastated and flood-prone areas. Klinenberg took over IPK in 2012. Two months later, Sandy hit. The first day his office regained power, Klinenberg convened a meeting of students and faculty interested in doing research in the city while the disaster was still ongoing. The idea was to generate on-the-ground data often not collected in the frenzy of the emergency, in the hope of better understanding how to respond to and help mitigate future events. IPK created the Superstorm Research Lab, a collective research community, and organized public events that drew as many as 1,000 attendees. Owing to IPK’s visibility on the climate resiliency issue (and to Klinenberg’s January 2013 article in The New Yorker about climate-proofing cities), Klinenberg got a call from Henk Ovink, a Dutch climate change planner and member of the Obama administration’s task force on Sandy. At the time, Klinenberg admits, he had no idea what IPK would do but jumped on board anyway. What IPK is doing is leading whirlwind tours of the region for the visiting teams. As with most major international competitions, not all of the participants are from the area. So IPK is showing them housing projects in Manhattan; waterfront in Hoboken, New Jersey; the devastation up and down the Jersey Shore; flood-prone areas on Staten Island; and destruction of various kinds in the Rockaways, Red Hook, and even Connecticut. Roughly 100 team members (the attendees vary with each event) have toured as large groups six times, then reconvened for presentations by experts (mainly from academia) who are linked to the tours. Because the teams will have to invent their own projects from scratch, the wide range of these symposia both help them select their focus areas and also see the big regional picture. Klinenberg describes it as a “master class in regional analysis for the world’s best designers.” Oh, to be a fly on the wall.